It’s no secret that we’re big fans of the ‘bear of very little brain’ round these parts. Winnie the Pooh and his friends feature pretty heavily in Bubs’ day to day life; whether it’s watching Piglet’s Big Movie, reading about the Trouble With Bees or snuggling up to Eeyore at bedtime. Bubs was very kindly bought today’s book (or, to be more accurate, books) for Christmas by her Uncle G. It has held the top spot on our bedtime reading list ever since. 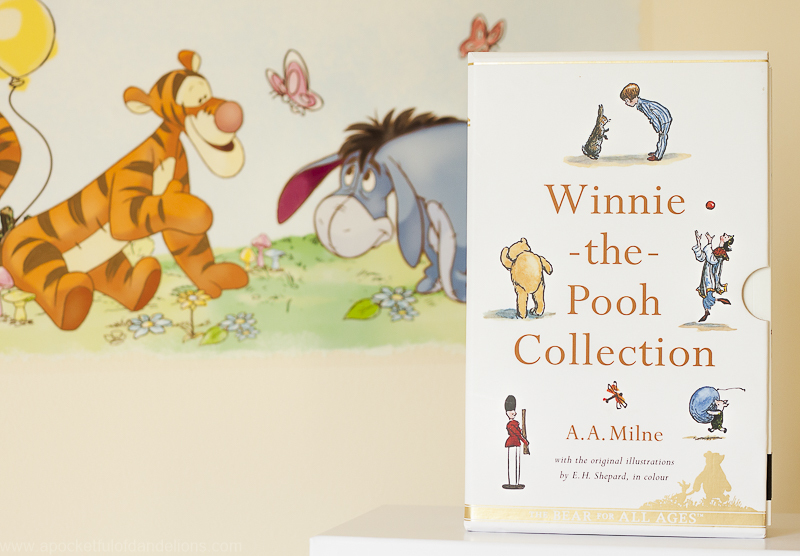 The Winnie the Pooh Collection consists of four paperback books; two containing the original short stories and two of poetry. They all have E.H. Shepard’s beautiful illustrations decorating the pages and really are a delight to look at and to read. We’ve been reading Bubs one of the short stories at bedtime every evening. On most nights she’s asleep by the third page and I don’t know about Hubs but I certainly read on regardless. I love the stories so much. I suppose that’s the mark of a good children’s book isn’t it, when us grown-ups don’t mind reading them for the umpteenth time. If you would like to share what you’ve been reading then pop over to visit Carie at Space for the Butterflies and join in. Oh how gorgeous – I love that it’s a collection of little books rather than one giant volume – we’ve got a few complete collection books and they’re wonderful but huge and a bit difficult to read when we’re all curled up in bed together. And yay for the original illustrations and all the lovely little bits like the poetry that got left out of the Disney versions! Being paperbacks they’re great for bedtime reading. Our big hardbacks are hardly seeing any use lately. Looks like a wonderful collection Vickie 🙂 And poetry too! Rosalie has the ‘pooh sticks’ story, but it’s a little long for her at the moment, but she loves the pictures. The poems are wonderful. All of the old favourites like ‘Halfway Down’ and ‘Buckingham Palace’.